Anyone who has been following the launch of the Verizon based Motorola Droid was bound to be envious of a major feature added in by Google. 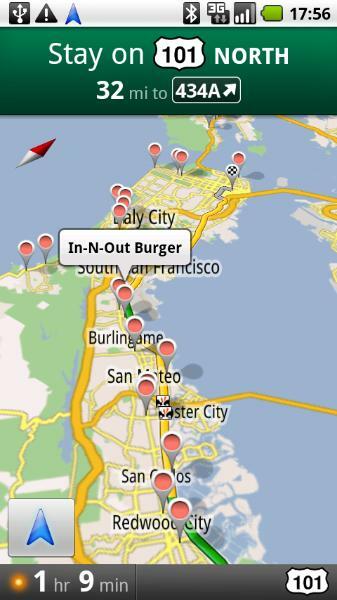 Google Navigation aka Google Maps on steroids, offers full navigation to help you find every In-N-Out Burger known to man, as pictured above. Originally thought to be offered to all Android devices sporting 2.0 and up, Google has gone and made some happy Android users by allowing those with “Donut” based Android to grab the app from the Android Market this very moment. We know the G1 has been “running” Google Navigation for the better half of two weeks now via a little hackery, but this time it’s a legit edition and available for your road tripping pleasure. Hit up the Android Market and sound off below after you take this for a spin! Oooh very nice. Great for all you android fans. I hope it becomes available for blackberry soon. Sweet! That was nice of them…. Wow that almost looks usable for navigation! I’ll be sticking to my WMo phone with TomTom & $10/m data plan for now though thank you very much. Is this a sign that T-mobile won’t allow 2.0 to be pushed to current devices so Google is just doing what it can to work around it? I’m just speculating, but would anyone be surprised?? YES. I was thinking about buying a TomTom. “IM GOOD”! how do i get google navigation on my mytouch with android 1.6? If you go to the Market and then the “Downloads” page, it should tell you that Google Maps has an update available. search for google maps. it is an “update” to the existing app. it’s taking a long time, but almost done! Very cool! Quick and easy to use. It will even auto reroute if you miss your turn! Sounds cool. How does it compare to something link TomTom or Garmin? As in cockpit view, turn by turn voice directions, street name voice text to speech announce, etc? It works as good as a Garmin or Tom Tom GPS device. Thx donosaur! Seems that is not the same as google maps that I’ve tried on Windows Mobile then because TomTom or Garmin is 100x better than google maps on my WM phones. If it wasn’t for the rip-off data @ $25/m vs $10/m that I pay I’d probably try out an Android phone but just can’t justify the additional cost when I’m trying to prune down expenses not raise them. Haha glad to see the xda hackers forcing Google’s hand yet again. This never would have been released for 1.6 if it wasn’t hacked to our phones first. I feel this trend will continue and somehow Google will find a way to fit 2.0 on the G1. I don’t know donosaur. One thing about Google is they’re full of surprises and have an army of developers. I think the fact that there was only 1 Android 2.0 device on the market was what made them decide to do that… and the ‘do no evil mantra’. It works really well! Awesome gift google, thanks! I love it. I intentionally went the wrong way a few times to see how fast it would reroute and it was fast. It even showed a picture of my destination from street view. what happens with this thing if you lose 3g service? Or service in general? Oh crap I totally forgot google maps needs to be online! That is a major deal breaker for many like me who have MANY dead zones while driving.. Google definitely needs a way to at least cache some map stuff locally for that otherwise it’s not real useful because I find it hard to believe about everyone doesn’t hit a dead zone at least now & then.. This man has some good ideas. He ought to write to Google and let ’em put them into action. No fair suing them for theft of intellectual property when they do so, though. GREAT…….DOWNLAODED IT ITS AWSOME!!!!! WORKS VERY GREAT!!!!! this sounds awesome, can’t wait to try it out! Another important thing to remember is that it’s to Google’s advantage to push this out to as many devices as they can. Remember that they get their traffic data from phones with Maps running while driving, so the more devices that are keeping Maps open while they drive, the better data Google gets. this is a pretty big deal honestly. Stand alone GPS unites will be a thing of the past in a year or two. Yeah. Let’s get this to the blackberry ASAP! This sounds pretty cool/useful just won’t give up my blackberry for it. Pronto pronto google let’s have the blackberry version! Oh SNAP! Just threw my old Garmin out the window! w00t! I jsut used it last night on my way home from work.. It works great. i was able to Nav through Kansas City with no problems on my way home..
aka Google Maps on steroids. haha, seriously though. This is awesome. Now christmas just needs to come a lot faster so I can finally get my phone. when is the Android 2.0 coming to my phone!? Am I the only one that is having problems with Google Navigation. Everytime i use it, I get “search for gps.” Does anybody else get this and can some one help. Google help is useless.